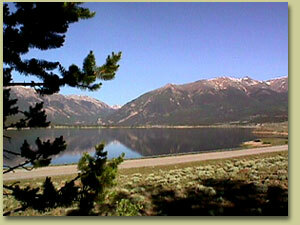 The Twin Lakes area is known to thousands of visitors as a wonderful place to visit. "The lower lake is nearly four miles in length by one and a half in breath, and it's soft, undulating, quiet shores form a singular contrast to the rugged mountains beyond. A straight, narrow terrace, twenty feet in height a natural dam- separates it from the upper lake, which is a mile and a half in length lying as if it were between the knees of the mountains. A triangular tract of meadowland slopes upward from the farthest end of this lake and is gradually squeezed into a deep, wide cañon, out of which the lake stream issues." 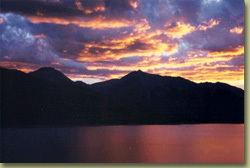 During a stay in the Twin Lakes area, visitors can enjoy both summer and winter activities. Summer activities include: hiking, boating, fishing, rafting, bicycling, jogging, mountain climbing, repelling, and camping. Golf, tennis courts, swimming pools, hot springs, and shopping are only a short drive away. Winter activities include: cross-country skiing, ice fishing, snowshoeing, ice-skating, sledding, snowmobiling, and alpine skiing. A natural hot spring, and recreation center with indoor swimming pool are close by. Of course you know that you guys have ruined it for us. It'll never be the same now. We really like going to B&B's. Your B&B was the 21st that we'd been to since we'd been married - in 13 years. And we've never had a bad experience...... But now you two have ruined it for us because from now on every one will be compared to you! We absolutely loved our stay at Ores & Mine. Thank you for such an enjoyable weekend and your generous hospitality. We will be sure to spread the word about your business and hope to see you again in the not to far distance!